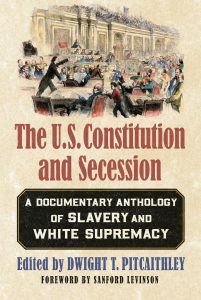 I reviewed Dwight Pitcaithley’s edited anthology The U.S. Constitution and Secession for H-FedHist. The review can be found here. On February 23rd, I will be speaking at Brown University’s History Graduate Student Association Conference, “Peripheries: The Politics of Space and Place.” My talk is titled, “Its Head in the City, Its Body in the Country: Rural Activism and the Fugitive Slave Crisis.” My panel, “Bounded Lives, Contested Spaces: New Horizons in the History of Slavery,” will run from 3-4:30 PM. The full program can be found here. On March 16th, I gave a presentation titled “‘An Overt Act’: The Fugitive Slave Issue and the Political Discourse on Secession” at the CUNY Graduate Center History Program Annual Conference. The program for that event can be found here. On April 7th, I gave a presentation titled “Connecting Slave Flight to the Political Discourse of the Secession Crisis, 1860-1861” at “Resistance, Rebellion, and Revolution,” hosted by the Stony Brook University History Graduate Student Association. On April 13th, I gave a presentation titled “Popular Non-enforcement of the 1850 Fugitive Slave Law in Northern Communities, 1850-1860″ at the Organization of American Historians conference in Sacramento, CA. The program for that event can be found here. On May 1st I was invited to workshop a paper title “The Fugitive Slave Crisis and the Politics of Secession” at the Yale Early American Historians Seminar at Yale University. I am humbled to announce that I’ve been awarded a scholarship from the Pi Gamma Mu Honor Society. Pi Gamma Mu in the nation’s oldest social science honor society. 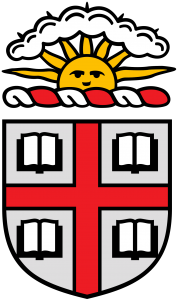 I was inaugurated as a member of the Connecticut Alpha Chapter at Trinity College in 2016. More information about the prize and the organization can be found in their newsletter. My historiography essay on slave flight in American Revolution was published at the Activist History Review in July 2017, and can be found here. I’m excited to announce the schedule for this year’s CUNY Early American Republic Seminar Conference. The conference will feature a number of exciting panels as well as a keynote address from Edward Countryman. I will be serving as the Chair for a panel titled, “Reactions and Interactions in Abolition Movements.” The conference will be on May 12, 2017 from 9 through 6:45, and my panel will run from 2 to 3:30. A full schedule can be found here. I’m humbled to receive the Colonial Dames of America Annual Fellowship. 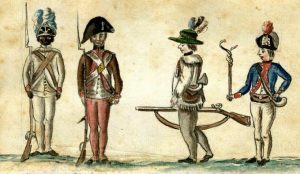 Each year, the Colonial Dames of America award fellowships to support research on early America at the Jamestowne Rediscovery Project, the Omohundro Institute, and the CUNY Graduate Center. More information on their work and philanthropy can be found here. 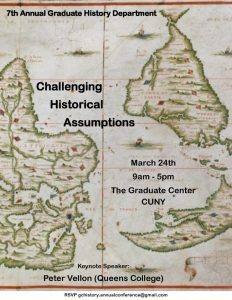 I will be presenting at this year’s Graduate Center History Student Conference, titled “CHALLENGING ASSUMPTIONS: Negotiating Spaces, Identities, and Sources Across the Historical Disciplines.” My paper is titled “Non-enforcement of the 1850 Fugitive Slave Law in the Rural North, 1850-1861,” and will be presented on the “Inside and Out of Urban Spaces” panel. The conference is on Friday, March 24th and the schedule can be found here. RSVPs are requested at gchistory.annualconference@gmail.com. 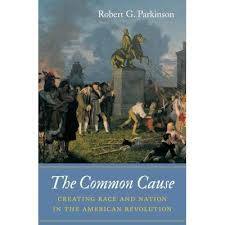 My review of Robert Parkinson’s The Common Cause: Creating Race and Nation in the American Revolution (UNC Press, 2016) as published in the GC Advocate in December 2016, can be found here.